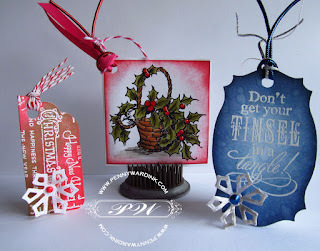 Hello paper crafting friends, how about some holiday tags that you can make in no time. With just a few more days until Christmas, your holiday cards are probably finished and the shopping is done. Now all that is left is wrapping and tagging the gifts. These cute little tags are super easy and fast to make. Grab your Card stock, embossing machine and …. 1) Die cut white card stock with Spellbinders Labels Eleven. Stamp and heat emboss in white Stampendous Christmas Background. Ink the tag using Mementos Lady Bug & Pistachio. Fold in half lengthwise, punch hole at top and thread with twine. Die cut a small snowflake from Spellbinders, cover with Stickles and add Rouge Liquid Pearls to center. 2) Cut white card stock 3 x 6 inches, fold in half. Cut another square of white card stock just a bit smaller than tag, using Stampendous Holy Basket, stamp with memento Black Onyx and heat set with clear embossing powder. Color with Copic markers. Ink edges with Memento Lady Bug. Attach to note card, punch hole in corner and tie cords/ribbons as desired. 3) Die cut white card stock with Spellbinders Labels Twenty-five. Ink with Mementos Danube Blue and Nautical Blue. Flick water onto tag to make water spots in ink. Let dry. Stamp sentiment Tinsel Tangle by Stampendous and heat set white embossing powder. Hole punch top, tie ribbons/cording. Die cut small snowflake by Spellbinders, color with Silver Liquid Pearls, attach to tag and finish with a dollop of Royal Blue Liquid Pearls in the center.